Nick Hand trained as a typographer at Stafford Art College in the 1970s. In 2009 he cycled 6500 miles around the coast of England, Wales, Scotland and Ireland recording and photographing the stories of crafts women and men. These inspiring encounters led to starting up a letterpress workshop in his home city of Bristol. At the Letterpress Collective, Nick and his colleague Ellen Bills, print their own work as well as commissions and running workshops. 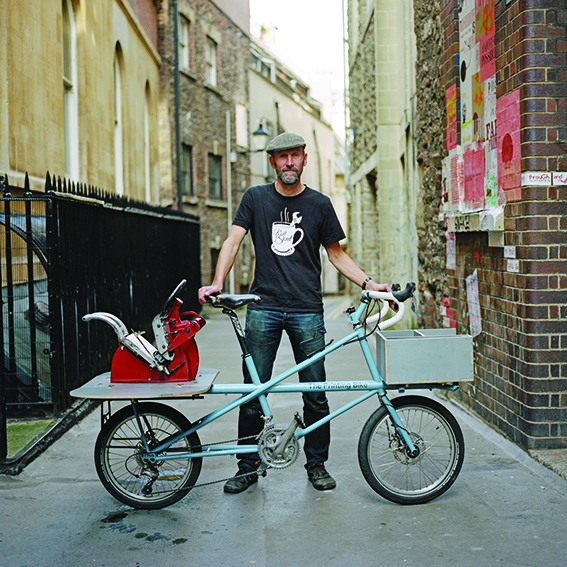 In 2013 Nick’s friend Robin Mather built a bicycle that could carry an Adana 8×5 printing press. Following the footsteps of the Journeymen printers of the 18th century, Nick has cycled from Bristol to Mainz printing along the way in homage to Johannes Gutenberg, the inventor, in 1450, of printing with moveable type. In 2017, Nick cycled from Land’s End to John o’Groats on the Printing Bike. On this journey he printed postcards in towns and city’s known primarily for making one thing. The postcards were illustrated by friends, and at each stop Nick printed and posted around 70 postcards.